…than we may think. 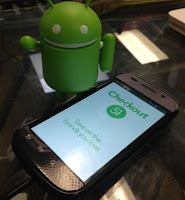 Rumor has it that Checkout 51 is working hard to have a Android app for us to be released in the spring! Wait it is not a rumor because it came straight from the source! I am so anxious for this as I am an android user and I am super excited to start using this ASAP!! This is what Checkout 51 had to say on their facebook page yesterday: It’s almost the weekend, but our lead developer is putting in extra hours to get our Android app ready for a spring release. Yay!